The word of the week is CARE. Have you ever felt like Jesus didn’t care about you? I’m pretty sure the answer is yes to that question, and I want you to know you are not alone. Take a look at Mark 4:35-41. The disciples and Jesus were on board a small fishing boat. It was dark, and Jesus was asleep after a long day of teaching. He was so tired that He continued sleeping through a fierce storm that came up. As the boat was filling with water and was on the verge of sinking, the disciples feared for their lives, so they finally woke Him up and asked, "Teacher, do You not care that we are perishing?" They didn’t think Jesus was concerned about their circumstances, and they were annoyed that He was sleeping through the storm. But, what they didn’t realize at the time is how Jesus was using this storm for their benefit - to help strengthen their faith. Why aren’t You helping me? These are the questions that come when we are overwhelmed by our circumstances; when we don’t have the answers; when our “boat” is filling up with water and we feel as if we are sinking. These storms of life are not fun to go through. They are scary, they are frustrating, they are hard. But, they allow us to see our personal weaknesses in order to identify what we really need. We need to remain faithful, because the Lord sees the bigger picture. We need to trust the Lord and call out to Him for help. We need to take hold of His hand, and be willing to accept His help. 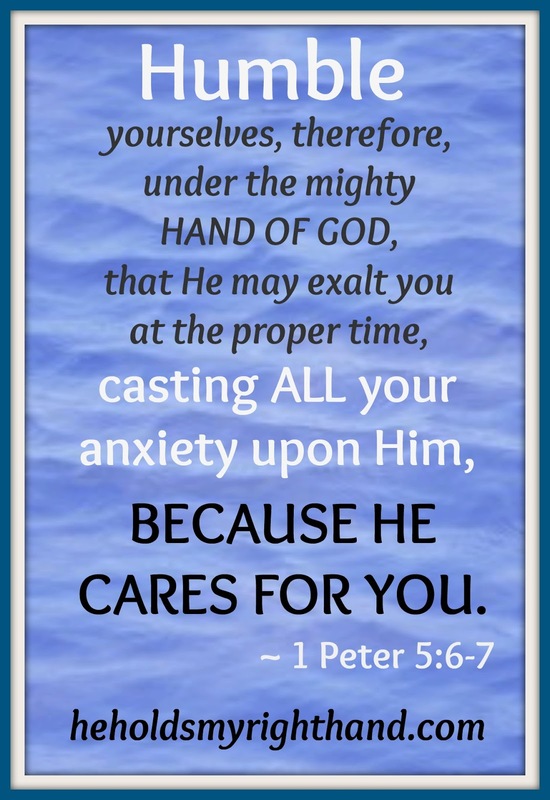 We need to ask Him to calm the storms (or to at least calm US and help get us through them). 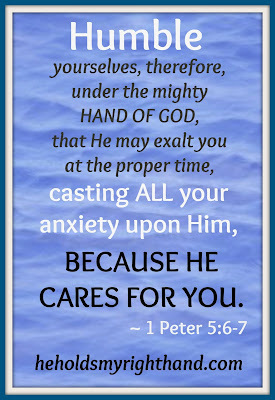 Cast your anxieties on Him today, because He does care for YOU. Matthew Henry Commentary: When Christ seems as if he slept in a storm, he is awaked by the prayers of his people; when we know not what to do, our eye must be to Him (2 Chr. 20:12 ); we may be at our wits’ end, but not at our faith’s end, while we have such a Savior to go to.